Glowing Genes is published by Prometheus books and can be purchased from Amazon. Marc Zimmer has written the first popular science book on an amazing new area of biotechnology, which will help fight cancer, create new products, and improve agriculture. For more than one hundred and sixty million years, green fluorescent protein (GFP) existed in one species of jellyfish. In 1994 it was cloned. Now GFP is found in every conceivable plant and animal. Flatworms, algae, E. coli and monkeys have all been made to fluoresce with GFP. Today researchers are using this ancient glowing protein to pursue exciting new discoveries, from tracking the process of bacterial infection to detecting chemical and biological agents planted by terrorists. A recognized expert in this field, Zimmer begins with an overview of the many uses of these glowing genes to kill and image cancer cells, monitor bacterial infections, and light up in the presence of pollution. He then discusses the biological reasons that glowing proteins first evolved in jellyfish and fireflies and looks at the history of bioluminescence and the dedicated scientists who devoted their careers to explaining this phenomenon. The story of how "glowing genes" were located, cloned and then mass-produced is in itself a fascinating tale. Zimmer next turns to the serious, and not-so-serious, uses of fluorescent proteins. In agriculture it may soon be possible to produce crops that signal dryness by glowing. In industry a red fluorescent protein originally found in corals may find a use in sheep as a substitute for environmentally harmful wool dyes. 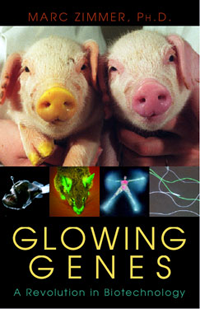 The glowing gene revolution has led to significantly more humane treatment of laboratory animals. No longer must animals lives be sacrificed to understand disease processes; now researchers can observe the spread of cancer with green fluorescent proteins. In the fight against terrorism, a glowing gene has been created that lights up in the presence of anthrax spores, chemical warfare agents and landmines. And in a completely different arena, we have already seen the emergence of transgenic art in Alba, the fluorescent bunny rabbit. The description of the evolution of the glowing gene techniques, and their applications make reading this book fascinating, and at time slightly disturbing. How can one resist not being both intrigued and slightly unnerved by pigs that have yellow toenails and snouts? (Taken from the Prometheus Trade Catalog).